Bin workers in Birmingham are being balloted on whether to take further strike action. 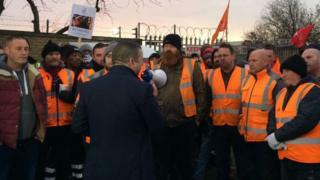 More than 300 workers started strike action on Tuesday over "secret payments" made to non-striking GMB staff after industrial action in 2017. The council has reiterated the payments were "properly made for a failure to consult during the talks that ended the 2017 dispute". Fresh strikes could take place in the spring if workers vote in favour. Hitting back at Unite's claims GMB members got "secret payments" for not striking, the GMB said the money was a compensation settlement over the council's failure to consult the union about changes to workers contracts, which led to 2017's strikes. Unite "demanded GMB's blacklisting from the negotiations", the GMB said and it will "not apologise for standing up for members". Unite said the GMB's claims were "inaccurate". The new ballot is over "grave concerns" for workers' safety, claiming the council is ignoring an agreement that lorries would not be sent on rounds without a waste reductions collections officer (WRCO) worker as part of the crew, Unite said. "As a result of the ongoing work to rule and strike action over the 'secret payments' made to non-striking bin workers following the 2017 dispute, the council has been increasingly sending out bin lorries without a WRCO," the union said. Unite and Unison members will stage a second day of strike action on Friday.